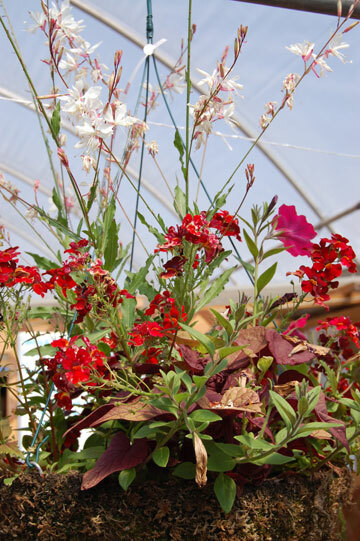 Add a spectacular dimension to a hanging basket or color bowl (container planting) with the tall, upright stems and delicate white or pink flowers of this “thriller.” Plant it in the center of a pot so that it can be viewed from all sides or at the back of a pot that will be displayed in a corner or against a wall. This is a fast-growing, long-lasting and easy care plant that does best in fertile, well-drawined soil. If it is planted in a pot it may need watering daily; it uses less water when planted in the ground. 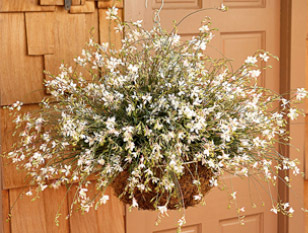 Fertilize it at least once per week to keep it blooming from spring to first frost. It’s a low maintenance, self-cleaning plant and no deadheading is necessary. Of course a plant called “whirling butterfly” has to attract butterflies. Bees and hummingbirds like them, too. Distinguishing Characteristics: Small butterfly shaped flowers floating atop willowy foliage.